Bugs and Fishes by Lupin: November Giveaway - Festive Goodness! To enter, just leave a comment on this post before midnight (UK time) on Sunday 29th November. I'll pick the winner at random on Monday 30th November. I'm happy to ship internationally, so anyone can enter. Please make sure you leave a name or pseudonym (no anonymous comments please) and be sure to come back on MONDAY [not Sunday - oops!] to see if you got picked. Good luck! Thanks so much for the chance to win such a lovely prize. Hi Laura, this is my first comment on your blog. We love your work! Here's hoping we win (my bday's June 2nd too)... Go Gemini! Those are so cute, Thanks for the competition. I love these goodies! Great colors, too. cute idea! I'm subscribed to your site via my mail reader and love seeing all the cute things you are up to! keep up the great work! I love aqua and red together, so these ornaments are right up my alley. Such pretty work! yes please! these are lovely! your work it's amazing! I hope to win these lovely ornaments! 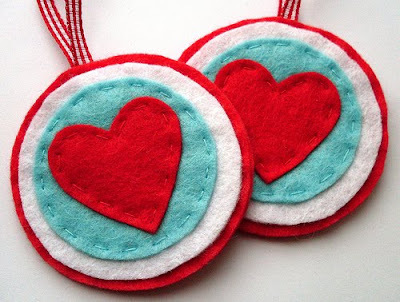 Love the ornaments with hearts, and the color combination is fabulous! Those Peppermint Baubles ROCK! Thanks for a chance at winning some! How Cute...please enter me in your giveaway. I love your blog and shop, very inspiring, you introduced me to what was once the scary world of felt. Ahhh, such beautiful little decorations. I love them and the colours are gorgeous. I love your work! Good luck everyone! Maybe this time I get lucky! Your things are adorable! Thank you! They are lovely, it would be great to put these on the tree. I love your felty goodness please include me. How exciting!! Thanks for this opportunity! How wonderful! These ornaments are so beautiful. Loverrrly!! You have such an eye for colour combos! I love your works. The heart baubles are so so lovely. Hi there!! I love your blog and all the work you do with felt... I have been working with felt for years and just love it!! I love many of your items. The camera ornament is quite nice, as well as all of your birds. You must have steady hands! 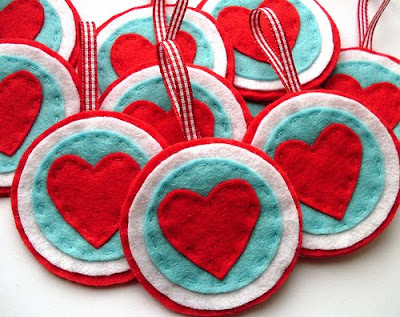 The peppermint hearts are lovely and will look wonderful with my Valentines Day decor! Thanks for the opportunity to win them. Yey thanks for the giveaway!!! I'm having one too at the moment actually. Those ornaments are so cute!!!!!! I don't think I've ever commented on your blog before, I promise to return and see what you're up to! my christmas tree is lovely inspired by your beautiful art, and I'd love to have these beautiful hearts. These are really cute! I love all the felty goodness you create! I would love to have these on my Christmas tree! They are lovely decorations - what a nice festive giveaway. I think your lovely christmas decoration would make a great start to my new Christmas colour schemes. Red felt always makes me think of Christmas. Yes please! My tree is in need of a felt fix. Oh yay, what a lovely giveaway. They would take pride of place on my tree if I won! I will hold my fingers crossed! What a lovely early christmas gift! =) Cheers! Oh, I love them! So fun and festive! How cute!!!! Your work is great. I would love to decorate our tree with such lovlies! Super cute! I love handmade xmas decs!! So cute! They'd look so pretty on my christmas tree! Your works are really impressive. Thanks for sharing with us! I love the baubles. They'd look great on any tree, or anywhere at Christmas. Beautiful colours that I wouldn't have thought to put together. Please enter me. Oh, my favorite color combination! I would love to win these hearts! I discovered your blog today... I can't stop looking into it! The things you create are lovely, and an inspiration for me. Thank you. hey!!! those hearts are beautiful!!! Hi, I've found your blog today and, after having surfed in, I've noticed the giveaway. Am I late to join in? If I'm not, would you consider me for the drawing? wow you have been busy lately! Love the ornaments and the garland looks like great fun to make! What a cute giveaway! I just love your work!!! I love your blogue! Lots of good ideas for crafts. I don't have the time I needed and wanted to do more things, but I'm steel trying! And be sure that your blogue is also seen in Portugal! Iei! I managed to read in time to post a comment, maybe i'll get lucky. I love the colours!